Theo, coming off a wild ride down a waterslide Friday afternoon. Photo by Amy Rauch Neilson. We are home, sweet home. It was wonderful to be away. The week couldn’t have been any better. We whooped it up, laughed with friends, loved, shared, played. I felt so terrific that I not only forgot I was a cancer patient for long stretches of time, but at one point, I even wondered if I really was a cancer patient. Just a flicker, the quick savor, of a moment. It’s wonderful to be back. Theo and I both missed Don a lot. We are complete when the three of us are together. It was good to smother Don with lots of hugs and kisses — Theo’s around Don’s legs, me around Don’s neck, when we greeted him. I only wish that this past week had been not only a celebration of close friends and good times, but of the final hurrah of my chemo regimen. Alas, that’s not the case. It’s hard to go back. Tomorrow, we begin again. An appointment with my doctor. Blood draws and labs to see where my counts are. Tuesday morning, 10 a.m., the nurse will insert the needle into my port and I will sit there in the infusion center as three separate bags of chemotherapy drugs drip into my veins. By the end, some four or five hours later, the color will have drained from my face and I will feel nauseous, disoriented, sick. I can do this. I know I can. I just don’t want to. But I will. Of course I will. The means will justify the eventual end: Remission. There is a date out there somewhere when I will no longer have to do this. I just don’t know what that date is. But I have the fortitude to wait it out. In the meantime, I look down the road in only brief glimpses, keeping my eyes on the here and now so that I can digest what lies ahead a little at a time. Small bits and pieces. Nothing too large to swallow or to overwhelm. Whooping It Up In Indianapolis! 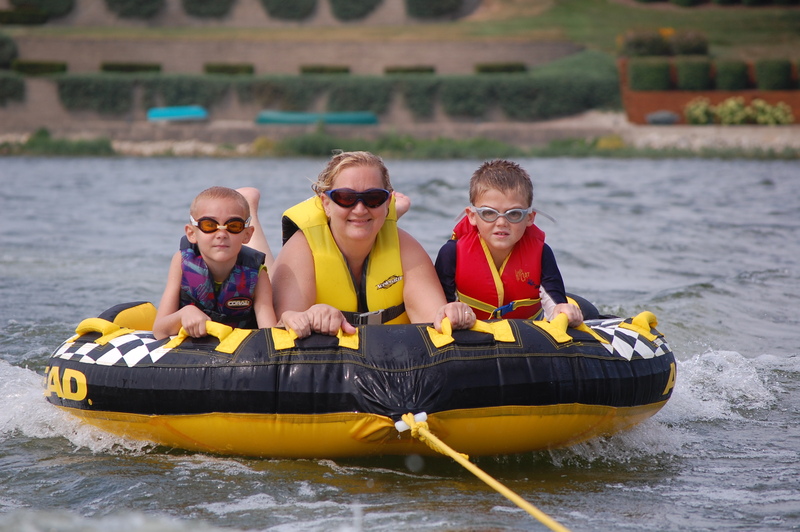 Tubing with Theo, left, and friend Aaron, right, on Geiser Reservoir, Fishers, Indiana. Photo by Greg Schrock. Theo, seconds before a jump rocket launch. Photo by Amy Rauch Neilson. We’re playing hooky, Theo and I. We bolted early Monday morning, hitching a ride with some long-time close friends who were, coincidentally, in the Detroit area over the weekend and heading back to their hometown near Indianapolis. It’s not just a vacation. It’s a necessity. Days after I was released from the hospital (note that “release” is the term of choice for both hospitals and prisons), I saw my shrink. She told me I was a mess, that she hadn’t seen me this bad since I’d received my diagnosis back in January. This I already knew. Don and I had an opportunity to go to dinner last week, just the two of us. We talked about how many steps backwards my hospitalization had thrown us. “Just when we’d gotten into a routine, all hell broke loose,” he said. And once again, the little certainty we had begun to depend on in our lives had been sucked down the drain. Even though our routine over the past several months has involved something as horrific as chemotherapy, it was still something we had fallen in line with. We knew that I’d be in chemotherapy Tuesday and Thursday for two weeks, off a week, repeat. As awful as it was, it had become our “new normal” and somehow, I continued to not only survive, but thrive. Over the weeks and months that followed, we were able to let our guard down just a bit, breathe a little easier. Then came my sudden and unexpected trip to the ER on Monday, July 11, followed by a week-long stint in isolation with teams of doctors hovering over me and blood draws by the gallon it seemed, as the search for the villain for my condition continued. By the time I was released Saturday morning, my mental state had reverted back to the terror and horror of January. I was a wreck and couldn’t seem to focus; my primal fight-or-flight switch had been flipped to “on” and I couldn’t figure out how to dim it, let alone turn it off. Don, I learned over dinner, was experiencing the same kind of regression. Somehow, he told me, we had to find our way back to that peaceful place we’d been in just weeks earlier. And that, we both agreed, was going to take some time. When life throws you a curveball, it takes a while to rebuild that sense of trust, of some semblance of a foundation. I told my shrink that I needed an “Out of Sight, Out of Mind” experience. I needed to be miles away from the hospital and the lab. Even my house, as beloved as it is, carries reminders at every turn, it seems. The calendar. Medical bills sprawled on the counter. Packets of gauze I’d been using to cover my lesions with wet/dry dressings. She agreed. I called my friends in Indy, people I’ve known since I was 14. They, as always, welcomed us with open arms. “Out of Sight, Out of Mind” quickly turned into “Out of State, Out of Mind.” And that’s how Theo and I ended up in Indianapolis this week. This is what I’ve learned about handling the mental facet of cancer — or of any difficult life circumstance. You’ve got to not just pay attention to the psychological aspect, but you’ve got to address it. There’s a lot of talk about the “mind-body” connection, but truly, physicians and mental health care providers still have a ways to go before they will be in sync with one another. I took her advice to heart and began making room on my calendar for “bright spots,” both big and small. It could be as simple as a date night with my husband, or as elaborate as a week in DisneyWorld with my hubby, son, brother and sister-in-law and family. Whatever it was, those Happy Squares on my calendar got me through. Long about July, though, I looked up at the calendar and realized that it was full of chemo and doctor appointments — many of which had to be scrapped, scratched off the calendar, and rescheduled due to low blood counts and my unexpected hospitalization. The calendar was void of Happy Squares. And I could feel the backlash in my life. So, I took the calendar down from the hook in our kitchen and began studying it. My chemo schedule has never been so unpredictable, with cancellation after cancellation following low white blood cell counts. Then, my week-long hospital stay for that terrible psuedomonas infection. Something had to be done. With my oncologist’s permission, I’ve opted not to return to chemo until the first week of August, which will give both my body and my mind a chance to recover. That left an unexpected, very big, very welcome blank spot on our calendar for the last week of July. Here in Indianapolis, we have spent the past few days filling in Happy Squares on our calendar — boating on the lake, swimming in the neighborhood pool, a trip to Dairy Queen for a tall vanilla cone dipped in chocolate, family dinners around a big table, full of laughter and stories, old and new. 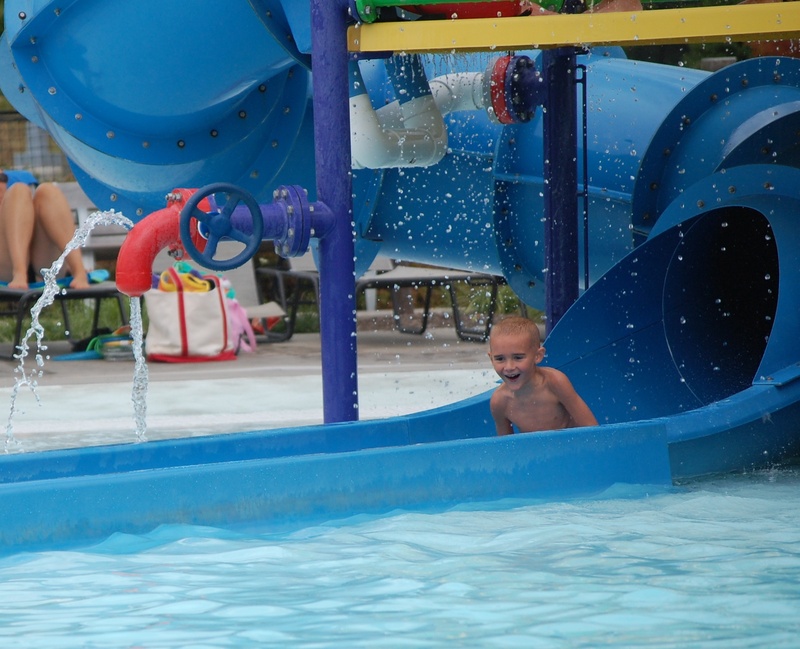 Today, another trip to the pool and tomorrow, the water park. And wonders abound. Theo’s first time tubing behind a boat. 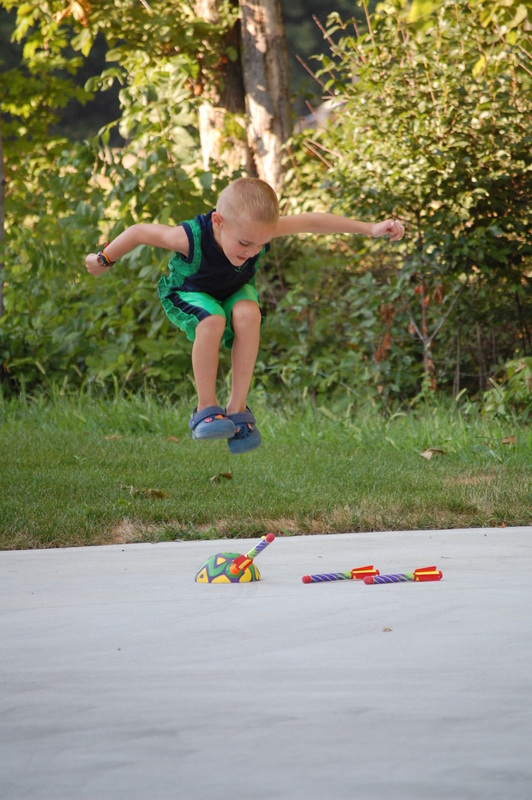 His introduction to the world of jump rocket launching (see photo, above), which has kept him busy for hours at a time. New-found friends with whom to find mischief. Theo is in heaven, as am I. I have come to believe that although my subconscious mind cannot totally erase the fact that I have cancer, my conscious mind can — and has — for a period of several days. That is giving my brain and my body some much-needed rest and recuperation. And that can only be a good thing. I recall once reading a fascinating story in Reader’s Digest about a detective who was hot on the trail of a serial killer, but somehow, every time he was about to close in on him, the serial killer guessed the detective’s next move and evaded capture. The long and short of it was that, in a fascinating series of twists and turns, the detective connected the dots and realized that the serial killer was none other than his best friend, with whom he’d been sharing the details of the case. It was such a shocking example of “truth is stranger than fiction” that even though years have passed since that story was published, I’ve never forgotten it. How incredulous the detective — let alone the readers — was when he realized that the villain had been there all along, right under his nose. How shocking for Don and I to realize that the cause had not only been right in front of us, but from a source that had been bringing us such pleasure during a stressful time in our lives. Don had always wanted a hot tub. But, they’re pricey and as the years passed, we never could quite justify adding this luxury item to our budget. Then my neighbor saw an ad on Craig’s List for a Free Hot Tub — You Move. We called. The owners were moving, the tub was in excellent condition, save the need for some new PVC tubing. No sweat for Don, who can fix, build and create anything. So, Don and a friend drove to St. Clair Shores to pick the hot tub up, and brought it back to our house, where Don put it in our garage for a couple of weeks so he could run power to it as he tinkered with it. Somewhere near the end of June, it was ready. Friends helped Don move it to our back deck, where Don scrubbed it, filled it with water, shocked the water with chemicals, and heated it. Waalah! We were in hot tub heaven! Don carefully checked the pH levels in the tub every day and used pool test strips to check the chlorine levels. He would often use the tub himself, late at night, long after Theo and I had fallen asleep. But on about four occasions, I joined him under the stars after putting our little munchkin to bed. Being in a hot tub in the first place, as an immuno-compromised person. I did not have a clue until after my week in the hospital that hot tubs were off limits for chemo patients. Sigh. Once again, I’d missed something critical. At the hospital, one of the doctors remarked that I was more knowledgeable about my condition than 99.9 percent of the patients he sees. That I didn’t know some of the basics — the information about fevers in chemo patients and that hot tubs are a no-no — is really scary. How is it that this information has somehow eluded me in the five years since I was first diagnosed with breast cancer? And what kind of a threat is it to other people going through chemo, who also somehow have missed this information along the way? “Hot Tub Rash” is not a problem exclusive to hot tubs. It can also be contracted in pools and lakes. The Pseudomonas bacteria that causes it is not uncommon. It is actually found in both water and soil. The good news is that, for most people, the rash that develops from exposure to this organism typically clears up on its own without medical treatment. Still, compromised immune system or not, I strong suggest you heed the tips I listed above. Change out of your swimsuit and shower immediately when you’re done swimming or hot tubbing. I now have an entire skin protocol prescribed for me by the brilliant dermatologist who saw the infection for what it was immediately — when he was finally called in. And, of course, I have no interest whatsoever in our hot tub. The end of this part of my story is a happy one, of course, because the culprit turned out to be perhaps the least dangerous and serious of the many possibilities the doctors threw out last week. Just as importantly, I’ve learned how to avoid it. So many times, including last week, concerned friends and family members have gotten on my case, sure that a party we threw or attended, or an outing to a movie theatre was going to do me in. So many times, I’ve told them that, within reason, I’ve got to keep on living my life. And now we know that threats abound — even in our own private, well-kept hot tub in the back yard. It’s also sad because I’ll miss sitting in the warm, bubbly water under the stars with Don and catching up on our days together. I was so excited after we got the hot tub that I ordered a floating checkerboard and a waterproof deck of cards, along with a special light that cycles through a rainbow of colors and patterns. But, I’ve figured out a compromise. No one said I couldn’t pull up a chair next to the hot tub and talk to Don while he’s soaking. So, that’s exactly what I’ll do, all the while praising God that I’m home sweet home and getting better every day. Photo Credit: The Pseudomonas bacteria, under extreme magnification, courtesy of Wikipedia. 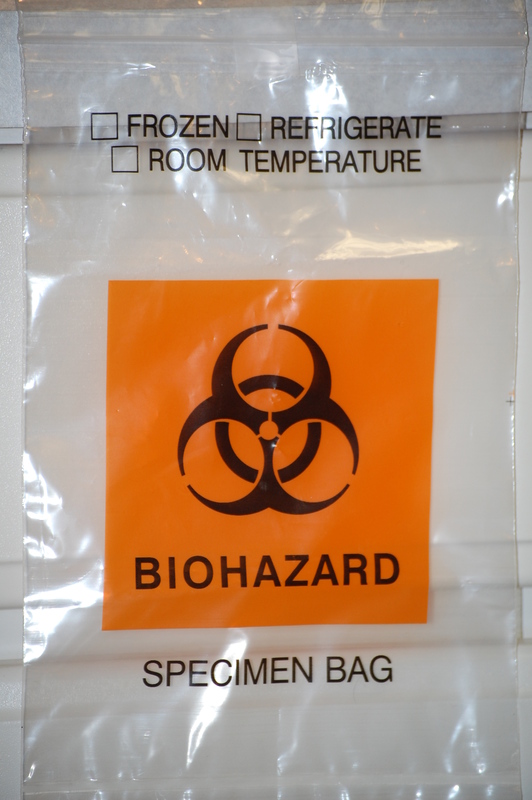 Genuine Biohazard Bag -- Confiscated Directly from Room #8874...Photo by Amy Rauch Neilson. Oh, the life of a biohazard. Who knew there were so many twists and turns — or that it could be so downright lonely? Last week, I had the chance to see what it was like to be a real-life human biohazard. I suppose the “glass is always half full” part of me could tell you it was an interesting and insightful adventure. But that wouldn’t be completely honest. It was actually quite horrible and, at several moments, something out of one of my worst nightmares. My complete immersion into the world of the biohazard began Monday evening, when the hospital consortium decided that it would be prudent to move me from the room in which I’d been admitted to one of the two isolation rooms on the floor. After all, I’d been examined by three teams of doctors so far, and no one yet had a clue as to the cause of the big, shiny black, swollen sore in my groin and the one on my left leg, both ringed in an angry red. For the next five days, every person who entered my room first had to suit up in a yellow gown, slip on rubber gloves and don a mask. Food services wasn’t even allowed in my room at all, so often times, they’d set my tray outside my door, where it sat until the next person to enter my room came by, noticed it, and brought it in. Once, when I heard the squeak of the food service cart wheels passing by my room, then the thunk of my tray, I waited a minute, then gingerly opened the door to grab my food. The alarm sounded and some member of the medical staff chastised me. I jerked my head back into the room like a scared rabbit. The alarm sounded even if the door was open just a couple of inches, warning anyone who came in that I was in Isolation and to take the proper precautions. The same air was recirculated in my room the entire five days until Friday morning, it triggered a migraine so severe I vomited. I’d tried to tell the nurse that I felt it coming on, but there weren’t any Orders by my Doctors for Fioricet, my migraine med. That meant she had to call for the Order, wait for the Doc to give the Order, wait for the Pharmacy to fill the order, then bring it to me. By then, it was much, much too late. I’d have never been able to keep the tablets down, so instead, she shot a healthy dose of an anti-nausea drug into my IV, waited for the vomiting to stop, then had me swallow the pills. No fresh air. No flowers or plants allowed. No balloons, either. My cousin Christine came to visit me one afternoon with a bright, cheery yellow balloon (my favorite color) with a huge smiley face on it. It never made it through my door. Someone from Administration snatched it, told her it wasn’t allowed, and that he’d hold onto it until she was clear of my room. But the culmination of the week — the Big Kahuna — was the afternoon that my bff Anita Griglio Kelly brought me a ham and swiss from Panera. I could only eat half. After all, how many calories do you burn sitting in a hospital bed? So, I asked the Nurse Assistant if there was a refrigerator available where I could save the other half for dinner. “Sure,” she said, like it was something she did all the time. She returned to the room a few minutes later with a clear bag imprinted with the big orange Biohazard stamp. That was the turning point, the moment that I realized I was indeed the Biohazard everyone feared. Thank God I wasn’t alone. Had I been by myself, I’m sure this realization would have triggered a series of virtually unstoppable, wracking sobs. Luckily, Anita was still there. She and I took one look at each other, waited for the nurse to finish bagging up the rest of my sandwich, then, once she was gone, burst into laughter. We couldn’t stop. I looked at Anita, who was, of course, wearing a mask, which rubbed against the bridge of her nose as she laughed, chafing it. Still, she couldn’t stop. Neither could I, even though my groin, where one of the swabbed biopsies had been taken, was killing me. Laughter is very healthy and a great release. Thank God for this amazing tool of the human spirit. The guesses of what it was that I “had” ranged from MRSA to Shingles (which spreads as an airborne disease and was the primary reason for my Isolation), a severe reaction to the highly-toxic chemo regimen I’m on, to the unknown — and utter and complete bafflement of the teams of docs who were working their hardest to figure it out. There was great irony when the dermatologist and his team — who were finally called in on Thursday — saw it for what it really was: An infection in an ingrown hair that had gotten wildly out of control in a patient (that would be me) who has a severely compromised immune system. Five days in Isolation and I’d never been contagious in the first place. Of course, in defense and to the credit of the docs who saw me earlier in the week, they’d never seen an ingrown hair infection pop up in several areas of a patient’s body at the same time. How this happened is something I’ll explain in Part III of this series. And, of course, though I loathed Isolation, I’d truly do it again if it meant keeping others from contracting something contagious I was carrying, or vice-versa. 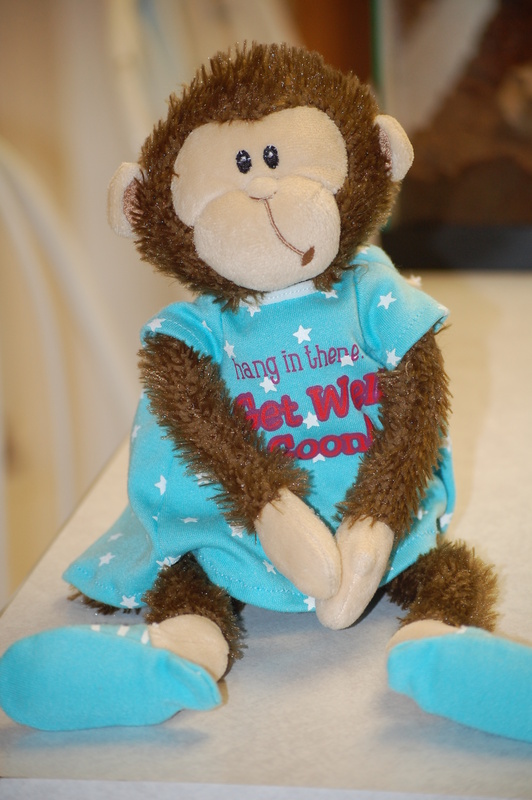 My hospital monkey -- the one Theo has named "Shiny" -- a gift from my friend James Mettert. Photo by Amy Rauch Neilson. My reply? “You mean my anthology?” Seriously, the sheer volume of information and story is becoming mind-boggling. So, this week (I’m being optimistic; it could take longer), it’s a series. Today is Part I.
I’m sure I need not tell you that last week was terror-filled. I can tell you that until the moment that I walked into the ER — on my doctor’s orders — and was assessed, I had no idea how very sick I was. That was Monday. Let’s back up a second. Saturday night, I came down with a slight fever and chills. 100.3 or thereabouts, a number that I recall Theo’s pediatrician telling me is really clinically the lowest bar of a fever. So, I took some Motrin and went to bed. Sunday, I awoke, more tired than usual, but fever-free. The area on my groin, however, had begun to grow and swell and a black, shiny center appeared. What the heck? I thought. I decided to call my oncologist Monday, one of the days that she is in clinic, and ask her to squeeze me in and take a peek. By Sunday night, though, my groin was very swollen and the sore in the center was getting bigger, too. I spiked a fever of 101.5, but again, with Motrin, it went down and I went to bed with a Note to Self: Call Doctor First Thing A.M. Which I did. And when the nurse heard my description, she said, “You need to go to the ER, immediately!” Don drove directly from work, picked me up, and off we went. I had been feeling so well Monday morning that quite honestly, I was sitting at my desk, working, when I talked to the nurse. Again, no fever; I had no idea the danger I was in. By the time we got to the ER and back to an examining room, my fever had spiked to 102.5. The ER docs were in a panic. The One In Charge came to see me and said she feared a blood infection. “This is very serious,” she said. I was getting very scared, as was Don. “But you will be able to make me better, right?” I asked nervously. “We hope so,” is all she said. They immediately started an IV and began pumping me full of a huge bag of an antibiotic I’d never before heard of: Vancomycin. Apparently, Vanc is the Big Guns, saved for patients like me whose life may be on the line. I was in the ER for hour upon hour, with no way to communicate to the outside world (my family and close friends were terrified) except through my blog/iPad. I learned long ago that once you go into the ER, cell phones cease to work, communication becomes very difficult. It wasn’t until I reached my hospital room late in the day that things slowed down enough for Don to be able to reach out to our closest circle with an update. It was a long, nerve-wracking day for all of us. I learned something — well, a lot of somethings — that day, the biggest of which is about chemo patients and fevers. I’ve been operating for 40 years from the perspective of a healthy person, and a healthy person doesn’t run to the ER for a low-grade fever. But I need to operate from the part of my brain that is the cancer patient. Fevers (how did I miss this along the way?!) are a very big deal in chemo patients. Especially those whose white blood cell counts are dragging along the basement floor. I didn’t know. I didn’t know for so many reasons. Because the information about chemo and fevers had somehow eluded me. Because over the weekend, I’d also been taking a series of Neupogen shots to boost my counts, and when I got pain and felt yucky, I attributed it to the shots. It’s not unusual to not feel well when you’re shooting yourself with Neupogen every day for five days. If you are in active chemo treatment and you get a fever, call your doctor and go to the Emergency Room. My doctor told me that 6 – 12 hours of a delay in receiving the antibiotic treatment I needed could have made all the difference. I can’t bring myself to say it; you’ll need to read between the lines. Second thing to know: When a chemo patient has a fever, add two to three degrees to what the thermometer is registering. That’s the chemo patient’s true fever. Now, with this knowledge, scroll back up to the numbers I saw on the thermometer, and you’ll see — as I shockingly later realized — what my fever really was. I don’t think Don is far off the mark. Not at all. 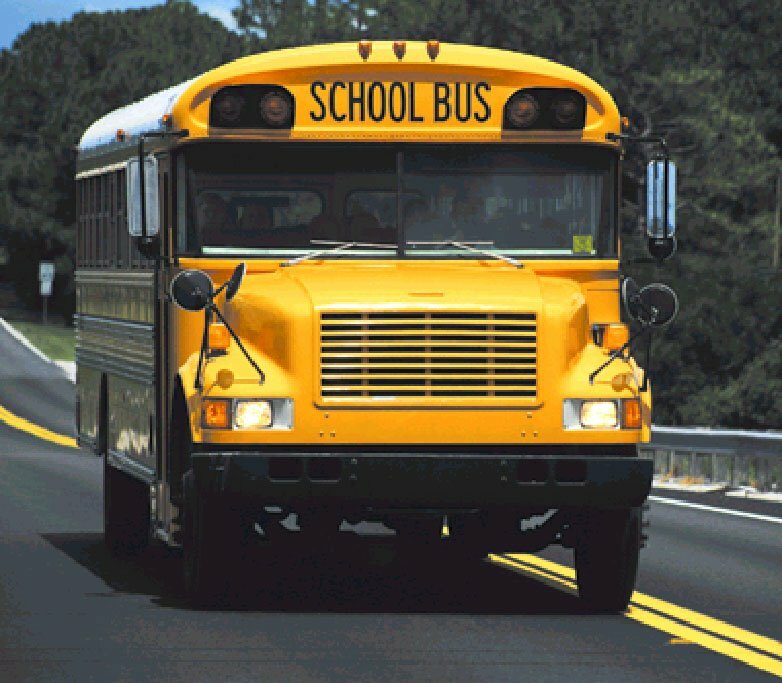 Not That Danged School Bus Again! If you see it coming, get out of the way for Pete's sake! I’m afraid I could lose my battle to Stage 4 breast cancer someday. It’s not going to be tomorrow. But then again, I could be leaving the planet far sooner than I ever imagined. Last week’s hospital stay was a shocking reminder of just how fragile life can be, how suddenly and unexpectedly it can come to a screeching halt. No one ever plans to live to say, the ripe old age of 30, 40, or even 50. When we look out at the horizon of life, most of us see 70, 80, perhaps even 90. That’s the purpose of those “life expectancy in the United States” stats — so we know what we’re shooting for, what’s typical. But a late-stage breast cancer diagnosis acts as a zoom lens that brings that horizon line into focus at close range. I’ve always envisioned a long life, maybe 80. I’ve had a pact with my bff Diane for years. We met when we were 19 and promised each other then – and on many occasions since – that we would one day rock in chairs beside one another. That was the plan. And it’s still the plan. But a Stage 4 breast cancer diagnosis, well, let’s say it throws a little wrench into our deal. Do I believe I’m going to live a long time? Absolutely. I know that there are amazing new breast cancer treatments in the pipeline right now and that I have a good shot of living long enough to reach them. Yet, it’s somehow not a contradiction to also say that there’s a fear – a very real and justified fear – that I might not. 2. It’s a poor analogy. And over the past few months, I’ve learned that there are lots of versions of The Bus Analogy. There’s the airplane, car, Mack truck…you get the picture. All of which are true. Except. Except that if you really fear being run over by a bus, involved in a car accident, or on a doomed flight, you have a choice. You could opt out. All of these threats are outward. Mine is inward and I can’t escape it. It’s with me everywhere I go. I have no choice. That’s the difference. And why The Bus Analogy — although I know it comes from the heart of people who wish to meet me on common ground — just doesn’t work. Not only doesn’t it work, but many times, it’s followed by a disconnect. I feel misunderstood, despite the best of intentions, and I get quiet. Conversation over. So, what to do when you find yourself walking in these shoes beside someone like me? Or all of the above. Your heart is in the right place. Rest assured that anyone who hears your words, your attempt to calm the storm inside of them, knows that.